The first voice mail was Mom’s doctor saying ‘Your Mother needs 24-hour supervision.’ Next up was my legally blind and deaf Uncle John shouting, ‘Ignore the doctor when he calls. I see her every day, she’s fine.’ Finally, Dad took the phone from Uncle John and added, ‘Don’t worry, Frannie, I’ve got everything under control.’ If the conflicting descriptions of Mom’s health weren’t bad enough, the part about my very demented Dad who could not find his way to the store and back again having everything ‘under control’ was enough for me to buy plane ticket. OK, long distance caregivers, all together now: “OMG, I went through the same torture so many times.” Good news: You are not alone; at least 200 caregivers have told me they were afraid not to go see their parents because of the potential danger. Bad news: Most caregivers spent a fortune on plane travel, accomplished nothing, and repeated their actions on the next call. Most of us are accomplished users of support systems: computer tutorials, car/home service contracts, child care, health insurance, etc. We pay these services because we instinctively recognize the benefits of retaining experts for help in certain areas. We derive peace of mind knowing help is only a phone call, GPS entry, or Google query away. 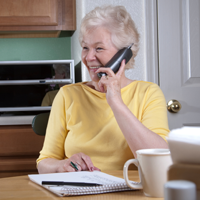 Best Option: Retain a Certified Geriatric Care Manager (GCM) to visit your parent if you call with a problem. The GCM will report accurately and cost a great deal less than a plane ticket. (Bonus: you can return to using your vacation days for actual vacations instead of caregiving issues). Alternative: Ask your parent's clergy or friend for the same backup. This may save money; however, it's unlikely anyone but a healthcare professional will have the knowledge to report accurately, accompany mom to the hospital, read the charts, and let you know whether you need to buy that airplane ticket.